This month, we are taking time to recognize the amazing potential of pit bulls. Dogs like K-9 Kiah, rescued from abuse to become a narcotics detection dog for the City of Poughkeepsie Police Department, who graduated and joined the police force on November 20. • Create an opportunity for officers and the community to witness the underlying potential of everyday dogs, which are not traditionally used for law enforcement work. 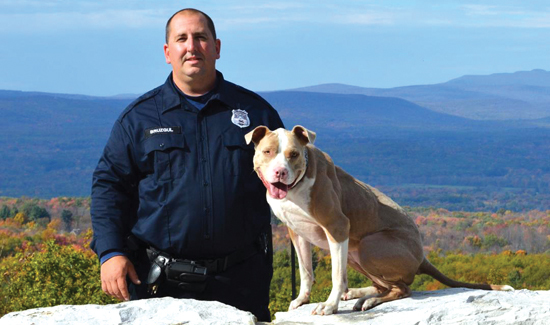 Before joining the City of Poughkeepsie Police, Kiah was rescued from severe abuse and cared for by Kirby Animal Care Services in San Antonio, where the staff recognized the dog’s drive and potential for detection dog training. To become a narcotics detection dog, she underwent an extensive training process with her trainer, the founder of Universal K9, Brad Croft.